In the world of uninterruptible power supplies, parallel architecture has always been available as a way to increase the fixed capacity of an overall UPS system or provide N+1 resilience. The principle is simple. If you have a 500kVA UPS system and want to add N+1 redundancy or increase the UPS fixed capacity to 1MVA (2×500kVA), you have to add parallel cards to each UPS system and install the necessary electrical infrastructure and power distribution. An interconnecting comms cable allows each UPS system to communicate with the other and the firmware is configured accordingly for master/slave arrangements (which can be fixed or automatically chosen) and load sharing. Each UPS has a built-in static switch and internal maintenance bypass. Each UPS system may have A and B supplies (dual input) and each may have their own battery or share a common battery, dependent on the levels of redundancy required. A wrap-around external UPS maintenance bypass panel may be installed for the entire system. In this arrangement the individual 500kVA UPS are called ‘modules’. If one requires service, the other ‘module’ is rated to take the full capacity of the load. A similar approach is available using ‘modular’ UPS systems. In a modular uninterruptible power supply the configuration is similar but with UPS modules inserted into a fixed capacity frame. Typical module sizes are 25kW or 50kW and the frame sizes can run from 125kW to 500kW. The UPS frame has a fixed capacity with suitably rated power distribution and a built-in maintenance bypass. Each UPS module has its own static switch and can be inserted into the frame in a ‘live/hot’ environment. There is no need for downtime. The modular UPS principle is growing in popularity, as ‘modular’ allows right sizing, planned growth, reconfiguration, lower service and maintenance costs and higher operational efficiency and resilience. A modular 500kW UPS frame can house up to ten 50kW modules. An expanding datacentre could install the frame on day one with five 50kW modules to achieve 200kW N+1 or 250kW capacity. As more server rack rows are deployed, additional 50kW UPS modules can be added to the modular UPS frame to increase capacity and maintain resilience as required. For Tier 4 datacentres 2N can be maintained with either type of UPS configuration. With a modular UPS system two or more UPS frames can be operated in a parallel and supplied from separate A and B supplies. A further advantage of the modular UPS approach is Total Cost of Ownership (TCO) and service times. Modular UPS system prices are reducing and will one day reach near parity with fixed capacity uninterruptible power supplies. In terms of operational efficiency both types of UPS are comparable, with modular UPS have a slight advantage over fixed capacity systems. The ability to reconfigure a modular UPS system to meet load demands provides a degree of flexibility not available with fixed capacity UPS systems. This can be used to optimise operational efficiency, as the system will automatically power down those not required into a ‘sleep mode’. Modular UPS can also operate over a wider demand curve down to as low as 25% at 97.5% efficiency. UPS maintenance contracts are generally lower in cost than fixed capacity systems. Modular UPS require less service and maintenance time. If a module requires replacement this can generally be achieved within 30 minutes of a UPS service engineer arriving on site. More time may actually be taken with on site security clearance, induction and RAMS (Risk Assessment and Method Statement) inspection than it takes to install the new UPS module. The site may also decide to hold a spare module on site ‘ready to go’. For a fixed capacity system, the site may store a ‘crash-kit’ but this will still require possibly several hours to install and test. Regardless of the type of uninterruptible power supply installed, there is still a need for some form of DC backup power and normally this will be in the form of a Valve Regulated Lead Acid (VRLA) battery set. As with fixed capacity UPS systems, some modular UPS frames are now available in a combination ‘combo’ format offering both UPS modules and a limited amount of battery runtime up to 10 minutes. This allows ‘in-row’ installation within the datacentre white space. For longer runtimes a separate battery installation is required. This could be in the form of a battery cabinet or batteries on a stand. In this type of configuration, the UPS system may be installed outside the white space in a separate plant room or with the UPS and battery packs installed in separate rooms. Ideally the battery should be installed as close to the UPS system as possible to reduce DC cabling costs. 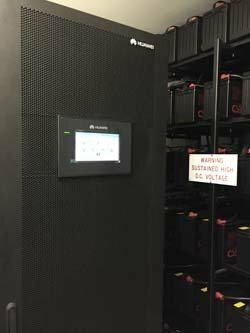 The future use of lithium-ion and super-capacitors in UPS as a DC power pack will further increase the adoption of ‘in-row’ and modular UPS systems. An added advantage being that this type of UPS system (with lithium-ion batteries or super-capacitors) will require less cooling than one installed with VRLA batteries. This is important in datacentres looking to reduce their cooling costs by raising operational ambient temperatures (ASHRAE standard). The recommended ambient temperature for a battery installation is 20-25degrees Centigrade. For every one-degree rise above 30degrees Centigrade, the design life will halve. UPS systems can operate up to 40degrees Centigrade but when using a VRLA battery this is limited to 20-25 degrees Centigrade. Lithium-ion batteries and super-capacitors extend the recommended UPS ambient to at least above 30 degrees Centigrade. The overall size of the UPS system and its associated battery pack may dictate where the installation can take place but should not over influence the choice between modular or fixed capacity UPS system. Reliability is also similar in both types of system, and many UPS manufacturers (Huawei, Riello UPS and Eaton Electric) now offer both types to meet the demand for uninterruptible power within different segments of the datacentre market place. There is as much statistical data to compare modular reliability with fixed capacity ‘monoblock’ type systems with the latter able to provide more field data due to the installed numbers over the last forty years. Overall the decision to adopt modular or fixed capacity UPS systems can appear to be a complex process. Ultimately it is the client and their approach to datacentre design that should dictate whether to adopt a modular or traditional mono-block fixed capacity UPS system. Both power protection strategies can support centralised or decentralised power continuity plans and are compatible with the uninterruptible power needs of Uptime Institute’s Tier-rating system. Both are also suitable for datacentres considering the new EN 50600 – European Standard for Data Center Design. The view of the Eco Power Projects team is that modular UPS offer a greater degree of flexibility in a datacentre world dominated by virtualisation and changing white space needs. This is evident in older datacentres where multiple rows of server racks have been removed and replaced with a cold-aisle arrangement that now takes up less than 50% of the original floor space. In newer datacentres, the modular UPS systems approach allows easier expansion to match the installation of additional cold-aisles and server rows.